Home > Sports > Comeback K.J. K.J. Tiefenwerth feared he would never play hockey again. A game that had essentially taken over his life since his childhood could have been stripped away. Things had just started to look bright for him. Unhappy with his freshman year at the University of Massachusetts, he transferred to Quinnipiac. Just four days after transferring from UMass, Tiefenwerth was at the hospital, about to undergo a previously-unplanned operation. He was nervous. His mother was nervous. So were his friends and other family members. It was a six-hour, life-altering procedure, but it was necessary. Originally from North Belmont, N.Y., Tiefenwerth’s hockey career began at a young age, in an attempt to model himself after his older brother. Tiefenwerth started out playing roller hockey, and made the transition to the ice rink when he was approximately 8. As Tiefenwerth grew older, he bounced around between several travel leagues. Eventually, he played junior hockey with the Boston Jr. Bruins, a member of the Eastern Junior Hockey League, before taking an interest in collegiate play. Quinnipiac head coach Rand Pecknold originally recruited 15-year-old forward Tiefenwerth. The relationship grew from there on out. Over time, Pecknold continued to exhibit interest in Tiefenwerth. But for the Long Island native, Quinnipiac never materialized as a realistic option. The team didn’t need a forward at the time, and Tiefenwerth was also weighing opportunities to play with other schools, some in the Hockey East conference. Quinnipiac didn’t make an official offer, and Tiefenwerth committed to Boston College before later opting for the University of Massachusetts. Tiefenwerth chose UMass due to his relationship with former Minutemen head coach Don Cahoon, who saw Tiefenwerth play during his prep school years at Avon Old Farms and was key in recruiting him. Tiefenwerth also picked UMass to reunite with a former teammate who had recently committed to the school. Tiefenwerth spent a year in Amherst, Mass., as his brief Minuteman career didn’t go as well as he hoped. Cahoon, one of the reasons why Tiefenwerth chose to attend UMass, stepped down in June 2012 prior to Tiefenwerth’s arrival. Current UMass head coach John Micheletto later filled the vacancy. With Micheletto taking on the new role, the coaching change ended up impacting Tiefenwerth more than he had anticipated. The two did not get along, Tiefenwerth explaining that the rift was 100 percent of the reason why he left. After Tiefenwerth’s relationship with Micheletto deteriorated, his relationship with Pecknold picked up steam. As Tiefenwerth was looking for a fresh start, Jr. Bruins head coach Peter Masters contacted Pecknold in May 2013 about the sophomore’s interest in Quinnipiac. Tiefenwerth, as well as current Bobcats Matt Lemire, Zach Lucyzk and Dan Federico, all played for the junior club at some point before coming to Hamden. After speaking with Masters, Pecknold invited Tiefenwerth to Quinnipiac for a visit. The two sat down to talk, and Pecknold agreed to take Tiefenwerth for the 2014-15 season, as Quinnipiac’s squad was already set for this season. Tiefenwerth also wanted Quinnipiac because the school offered incentives that UMass could not. The university was smaller, which would allow Tiefenwerth to become closer with his professors. Additionally, Quinnipiac was closer to his hometown, while also possessing top-notch facilities and a men’s ice hockey program that was coming off a benchmark season. The move was all but official. Tiefenwerth would get a chance to don the Bobcat blue and gold. The only thing now remaining, as is customary when a player changes teams, was a physical. 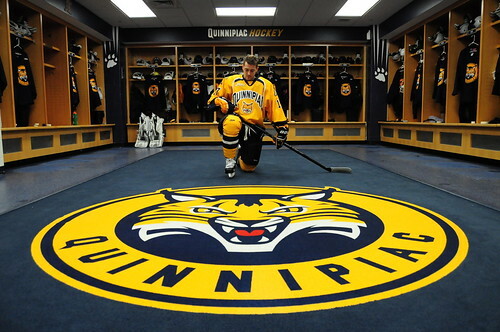 May turned to June, and Quinnipiac required a physical from Tiefenwerth in order to attend the university, a different one than what was previously needed at UMass. On the day of the physical, Tiefenwerth cleared the initial tests, and eventually was given the option of taking an ultrasonography, a tool for observing various body structures. The procedure would have added 10 to 15 minutes to the physical, and Tiefenwerth graciously accepted, in order to be thorough. The decision that seemed simple at the time ended up becoming a life-changing one. Through the ultrasonography, it was discovered that Tiefenwerth had a papillary fibroelastoma tumor on a valve in his heart. Tiefenwerth was warned that the tumor wasn’t going to affect him now, but it would in the future. The discovery was not accompanied by any symptoms, and was not normal for someone of such a young age. Papillary fibroelastomas are common benign tumors found in the heart, according to the National Center for Biotechnology Information. Fibroelastomas are treated differently based on their size and mobility. In most cases, surgery is recommended for tumors that are larger than 1 centimeter in diameter. Fibroelastomas are the second most common type cardiac tumors. Digital imaging has helped professionals recognize such tumors in recent history, as the technology did not exist in the past. It was recommended that the tumor was removed as soon as possible. Just four days after transferring from UMass, Tiefenwerth was at the hospital for his open-heart surgery, that could come with risks. Tiefenwerth was briefed the day before the operation that if the valve needed to be removed in addition to the tumor, there was a chance that he would never be able to play hockey again. “It would have been heartbreaking,” Tiefenwerth said. On June 18, approximately a week and a half after the discovery was made, Tiefenwerth went under the knife. The procedure took six hours to complete, with about 20-25 family members and friends waiting for him outside, Nancy said. Tiefenwerth successfully made it through the procedure, spending the next four days in the intensive care unit. The first day following the surgery, Tiefenwerth attempted to walk under his own power, but failed to do so. “He was in a lot of pain, he couldn’t really move,” Nancy said. After the initial week, Tiefenwerth was finally able to walk unassisted and was released from the hospital. Yet he was still a long way from resuming activity on the ice. His body contained air and fluids from the surgery, which would need to be drained over time through tubes connected to the body. Tiefenwerth’s ability to work out off the ice was limited as well. “It was a battle getting back in shape, especially with the workouts and conditioning they have here,” Tiefenwerth said. Tiefenwerth was visited by his friends in the weeks following the surgery, keeping him company while his condition improved. Tiefenwerth also spent time catching up with his older brother. Roughly three weeks after the surgery, Tiefenwerth was “up and around,” according to Nancy. At this time, Tiefenwerth could walk around without issues and ride a bicycle. It wasn’t until approximately two months following the surgery that Tiefenwerth was able to set foot on the ice again. For months, Tiefenwerth couldn’t practice the way he wanted to. Up until Nov. 3, Tiefenwerth was still recovering, and had not been fully cleared to practice with the team. On a typical day, Tiefenwerth would skate at TD Bank Sports Center 15 minutes early or 15 minutes late compared to the rest of the squad, but would head to the locker room before the team practice begins. Samuels-Thomas can relate to Tiefenwerth. After transferring from Bowling Green after the 2010-11 season, he redshirted for the 2011-12 season, rendering him ineligible to play that year. “You’re out there competing with the team, but not in the moments that you’re all working for together,” Samuels-Thomas said. Samuels-Thomas has spoken with Tiefenwerth on the subject, consoling the sophomore about his former inability to practice or play. Yet, Samuels-Thomas had seen Tiefenwerth push himself to the limit, even though his body would disagree. Two weekends ago, Tiefenwerth went home while also making a trip to the doctor, who later cleared him to play full contact. That said, Tiefenwerth still will not see game action, due to redshirting. Tiefenwerth, Samuels-Thomas and Quinnipiac captain Cory Hibbeler will occasionally work together as a trio in their mornings, practicing shots, screens and other “edge work,” according to Hibbeler. Though the work ethic is evident, Tiefenwerth still has much to learn, Pecknold said. Though he is not eligible to compete in the 2013-14 season, it doesn’t mean Tiefenwerth won’t be putting in his maximum effort over the next 10 months to make it as starting forward at Quinnipiac.